The CSS Fredericksburg was born in Richmond, between 1862 and 1863, and was the second Ironclad laid up in this town for the Confederate states navy. It was launched in mid-1963, and declared completed and ready for service in november, 30, 1863. However, it was unarmed at that time, and had to wait before beeing fitting out, which occured in march 1864 at Drewry's bluff and later put under command of Thomas R. Rootes, CSN. The Fredericksburg was constructed from scratch for servicing into the Jamese River. She was 2500 tons burthen, 188 ft (57m) long, 40 ft 8 in (12,27m) wide and with a 9 ft 6 in (2.90m) draft, built of wood and protected by metal plates. A steam engine with two shafts propelled her to 5 knots (9 kph), and has a 4160 nautical miles range (over 7000 km), with a complement of 150 men and officers. It was armed by one 11 in (280mm) smoothbore cannon, one 8 in (203mm) and two 6.4 in (160mm), all rifled, with eight available portholes, one at the front, one rear, and three per side. There were two protruding bridges, at both end of the roof of the casemate, which itself was highly sloped and slightly shorter than in many Confederate ironclads of the time. The CSS Fredericksburg carrer was relatively short. Beeing armed so late, it was only operational within the James River fleet (Commodore John K. Mitchell), succesfully passed Drewry's Bluff obstructions and assisted the operation of the fleet until the end of the war. On june, 21, 1864, she engaged the USS Onondaga at Trent's Reach, at large distance, a duel which ended in a draw. In August 1864 she also shelled US positions along the James river. Other inconclusive encounters with the US James river squadron followed at Trent and Verina Reaches, until the beginning of 1865, a duel with the same opponent, this time assisted by the CSS Virginia and Richmond (battle of Trent's Reach, 23-24 jan 1865), and shore artillery. However, in april 1865, receiving the news that Richmond has fallen, she sailed above Drewry's Bluff and was blewed up with several other CSN ships, to prevent her capture, the 4 of april. Soon, during civil war, the best Union naval policy chosen was to blockade the entire condeferate coastline by all means necessary, notably to halt confederate trading, make an efficient embargo on weapons and ships, and prevent any intervention by European powers : This was the famous "Anaconda plan". Although the Union fleet was sizeable -it dwarfed the Confederate navy by any standards- the task of convering a sea area so immense was daunting for the admiralty. In a stopgap measure, most ships were stationed in front of of major coastal cities and river outlets and deltas, like the Mississippi, the Chesapeake bay entrance, where the first american ironclads, USS monitor and CSS Virginia famously duelled. The admiralty, and above the Secretary of the Navy Gideon Welles, devised specifications in 1861 for a light-draft vessel which could perform at sea and inshore, beeing built fastly and in large quantities (23 units) by many small private-owned shipbuilders. The engine natural choice seemed to be the recent design of two Russian gunboats engines by Benjamin F. Isherwood (then Navy's chief engineer) at Novelty Iron Works in New York. But the hull design was drawn by Samuel H. Pook, probably based on 1860 USS Pocahontas. The design was immediately accepted and the contruction of the engines began even before the Congress signed the contract for all ships, between june and july. The four first gunboats were built in a record time, only 92-96 days, earning their nickname. The first to be launched, in october 1861 was the USS Unadilla, giving this class its official name. All ships were named after indian tribes. These were the Aroostook, Cayuga, Chippewa, Chocura, Huron, Itasca, Kanawha, Katahdin, Kennebec, Kineo, Marblehead, Ottawa, Owasco, Pembina, Penobscot, Pinola, Sagamore, Sciota, Seneca, Tahoma, Unadilla, Winona and Wissahickon. The Unadilla class Gunboats were launched between august and october 1861, and commissionned between september 1861 and february 1862. These were wooden ships, measuring 48.26 x 8.53 x 3.15m (158ft 4in x 28ft x 10ft 4in), with 691 tons of displacement (507 Tons burthen). The hull was made of white oak (frames keels and keelson), locust and live oak for port stanchions. Assembly was performed with corrosion resistant copper bolts, and structural weaknesses were corrected by diagonal iron braces and the stems by iron strapping. However unseasoned timber would have not been uncommon as their service life expectancy was deemed to be short. They had one screw propeller, two 30-in bore by 18 in stroke horizontal back-acting (RCR) engines (fitted with Sewell surface condensers), fed with two Martin boilers (vertical tubular type, 60psi on trials, with two furnaces each), which developed 400ihp in all, giving these ships a speed of 10-11 knots. The sailing rig was of a schooner type, versatile, easy to use with little manpower. Complement was 78-114 depending of the armament. This last depended on the builder's stores, mostly for small guns. The main typical armament comprised a main centerline full traversing 3.7in (93 mm) Parrot RML (Rifled Muzzle Loading), one 11in (280mm) smoothbore, and two 24 pounder howitzers. The Original first four however, were equipped with one 11in Dahlgren SB, two 24-pdr SBs and two 20-pdr Parrot RMLs. The private contrators were all chosen along the Eastern seaboard (in respective order of the ship alphabetical order) NW Thompson, Gildersleeve, Webb & Bell, Curtis & Tilden, Paul Curtis, Hillman & Streaker, Goodspeed, Larrabee & Allen, G W Lawrence, J WDyer, G W Jackman, Westervelt, C Mallory, Thomas Stack, CP Carter, Abrahams, A & G T Sampson, Jacob Birley, Simonson, Thatcher, John English, C & R Poillon and John Lynn. Howevern, most of the engine were built by NY contractors, Novelty Iron Works, Morgan Iron Works and Allaire works. Cost varied from $90,000 to $103,500. The Unadilla class gunboats were quickly posted in faction on all required blockade areas, releaving many ocean-going ships, corvettes and frigates of the Union for more useful duties. They will be in turn, backed by the kansas class gunboats, and the Octorara, Sassacus and Mohongo side-wheels class gunboats, 55 purpose-built ships in all. Appreciation of their performances were mixed. Some captains complains of thm beeing poor sailors, rolling badly in bad weather, and suffering many breakdowns. After months at sea, the engine performance was degraded, and average speed fell to les than 8 knots. Plus their machinery was far heavier than expected, hence reducing their overall efficience. They were praised however in riverine operations, for their firepower and relatively shallow draught hull. They had a quite active history, besides their main duty of enforcing the blockade, providing gun support in many operations, including the battle of Port Royal (South Carolina, november 1861), were four were committed, gauging the Confederate local forces strenght, and defeating two forts, leading to the eventual capture of the harbour. Later on, in april 1862, no less than nine of these gunboats were enlisted in West Gulf Blockading Squadron's David Farragut fleet to provide cover the the operations against New orleans, then the most prosperous Confederate city. Three gunboats succesfully remove the osbtructing chain at the entrance of the Mississippi river and others silenced St Philips Fort and Fort Jackson. The expedition led to the surrendering of the city. Next logical step was the city of Vicksburg. Some of these gunboats fought during the battle of Baton Rouge ending with the city's capture. They soldiered during all the Vicksburg campaign, until the end of 1862. Last actions were the Battle of Mobile Bay (aug 1864), with Itasca, Sciota and Kennebec, and Fort Fisher, in 1864 and 1865. Sciota was the only class casualty, struck a mine in Mobile bay waters on 14 march 1865. Although many gunboats were decommissioned and disarmed in 1865, many others managed to survive until 1869, serving with the Gulf Squadron, the North Atlantic squadron, and the Asiatic squadron (Aroostook and Unadilla), helping to clear the southeastern China seas from piracy. The USS Unadilla transported the new President of the USA, Andrew Johnson, for a stat visit to the king of Siam. All were sold to merchant companies, but their civil career rarely lasted until 1875-80 due to their rotting hulls caused by unseasoned timber. But this not prevent however some engineers to think about it, trying to solve the propulsion problem. The solution came in fact, in 1839, when the steamer SS.Archimeded made her maiden voyage from London to Sheerness. The particularity of this ship : It has a steam engine, but no paddle wheels were visible. Its secret was a device invented by the famous Archimedes of Syracuse during the IIIth century BC... and "reinvented" or readapted by John Ericsson and Francis Pettit Smith. After screw modifications, including a new one, shorter and in metal, and several other cruises, the concept was definitely validated by the maritime world, with awe... So much the impression it gave that the famous Great Western Steamship Company, then largely influenced by a no less famous chief engineer, Isambard kingdom Brunel, loaned the Archimedes and derived from it not only the biggest ship in the world, but also the first true modern liner : The SS. Great Britain. This was in 1845. By then, the screw seemed to have won the battle of civil naval construction. But what about the navy ? For the reasons seen above, the Royal Navy, like most of its rivals, was still reluctant towards Steam power, but the new device was intriguing if not promising for a new generation of naval engineers. One of them, the famous French naval designer Stanislas Charles Henri Dupuy de Lôme, was amazed by the screw applications and quickly devised plans for a ship of the line using it for propulsion, when he came back form Great Britain, when he mad a thorough study of steam power and iron shipbuilding in Great Britain. He saw the construction of the SS. Great Britain at Bristol and carefully studied its plans. Now, after publishing a memory about his observation by 1844, he started a feverous work at the arsenal in Toulon. His design was a screw-driver frigate, protected by iron plating, which he submitted at the marine minister on 1845. Joined with his colleagues of the "Génie Maritime" (naval engineering), he strongly advocated and lobbied the government. And by 1846, he had results : Alarmed by reports stating that the Royal Navy already has converted several "blockships" to steam power, the Minister ordered the same conversions. At the same time Dupuy de Lôme has drawed new plans for a more ambitious two-deckers battleship using steam power and a screw propeller. 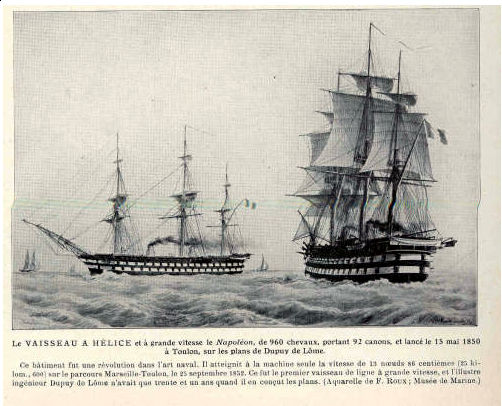 The construction was accepted in 1848 and the construction, at Arsenal de Toulon, ended in 1850 when the ship -then baptised "Le Napoleon", honoring the famous uncle of the actual Emperor, Napoleon III- was launched. Conversion of the Windsor Castle, which has already been launched, urged the need to cut the hull in half and lenghtened it by 9 meters to accomodate the steam engine and room for hundred of tons of coal. Total lenght of the hull reached then 73 meters (240 feet, without the bowsprit), and thanks to this early "jumboisation", the broadside gained some extra artillery, making itself after re-launching and re-christening (14 september 1852) HMS Duke of Wellington, in honor to the most important man in recent British History, just gone the very same day, the most powerful warship afloat. It dwarfed the famous Victory, five generations older, and was on par with the most impressive flagships in the French and Russian fleets, proudly bearing the general's bust as a figurehead. Completion came in january 1853, and the ship tonnage and size immediately captivated the British newspapers. With nearly 5900 tons, and a hundred meters overall, and broadside of 131 guns, totalling 382 tons alone, the ship was a masterpiece, and steam, at least nominally, greatly added to its potential, however its superb sailing capabilities were unchanged, as it was rigged for a maximal efficiency, demonstrated a 10,3 knots under sail alone during 1853 trials. The beam was 60ft (18,3m)and depht 27ft (8,2m). The mainmast culminated to 55m above the quarterdeck. As it was customary for the time, the hull section was trapezoidal for a better stability. After its first sorties as Flagship of the channel fleet Western squadron, it became the flagship of Vice-admiral Sir Charles Napier, heading for the baltic sea. War just broke out with Russia. In 1853, it returned for the next operations in the baltics, as rear admiral Richard S. Dundas flagship, bombarding Sveaborg fortress. CSS Savannah was part of the larger Richmond-class, one of the two classes or casemate ironclad built by the confederate navy during the war. The Richmond class was conceived a genuine design for ships to be built locally with limited resources, but in sufficient numbers, not to turn the tide of the blockade, but protecting harbours and coastal waters. The casemate ironclads were a perfect response for this. Built above existing ships, razed and rebuilt, or brand new, they were armoured above the waterline by iron plates backed by large buffers of timber. Artillery was limited to three to four guns, some beeing smoothbore but most beeing rifled. The Richmond class was drawed by CSN engineer John L. Porter to fill the requirements of the Confederacy Navy Department (CND) in late 1861, a policy of "home-built ironclads"; The CND ordered nearly 50 ironclads during the war, from which only half were effectively completed before the end of the hostilities. The Richmond class counted six ships, the Palmetto State, Chicora, North Carolina, Raleigh, Richmond and Savannah. They were the first, standardized, well-conceived ships for their limited goals, contrasting with former individual ironclads, much costier, both unsuccessful as blockade runners and too ambitious for harbour defence duties. They were shallow water pontoons, with a U-bottom section keeled hull, and with its waterline protected by a knuckle of heavy timber. Protection was made of interlocked 21in timber frame, covered with two layers of 2in rolled iron plates, with a 35 degree slope. The narrow upper casemate bridge, and fore and aft lower bridges were covered by a single 2in armour plating, overlapping the timber knuckle. The artillery comprised four guns, from which the two at casemate ends were able to fire from three portholes, and two broadside guns with shifted positions. This gave a good use of limited artillery and permitted the hull some extra stability, and saving weight. This solution was seen as perfectly fitted for the new CSN policies, allowing more ships to be built in a shorter time, saving cost and training and simplifying logistics. Another later class was built, sometimes called the Charleston or Nashville class, comprising also the CSS Tennessee. They were improved versions of the latter. The CSS Savannah itself was built by H. F. Willink at Savannah, Georgia, laid down in april 1862, launched in february 1863 and commissioned june 30, 1863. Propulsion was assumed by a steam engine from Confederates Naval Iron Works at Columbus, propelling a single 10 feet screw. Speed was an average 6 knots. The crew comprised 150 sailors and 25 officers, along with ten marines. Armament was made of two fore and aft 7in and Brooke pivot rifles and two broadside 6.4in Brooke rifled guns. A single 12pdr shield deck howitzer was also mounted. The pilot's hatch was situated abaft the smokestack. The Savannah became the flagship of the Savannah squadron, comprising also several gunboats, under William W. Hunter and later Robert F. Pinkey command. She served well, guarding the Savannah harbour approaches until late 1864. In december, during USN gen. Sherman march to the sea, she fough valiantly, supporting defensive troops, later, the USN battery involved in the siege, then evacuation, exchanging broadsides with federal batteries before beeing burned by its crew to prevent its capture. The confederacy, always trying to wage a potent naval warfare with its limited resources, tried several spar torpedo vessels and rams, notably to deal with blockading ships. These anchored targets were perfect ones, beeing unable to built steam fast enough to sail out of harm... If only the attacking ship was fast and stealthy enough, and can protect itself if discovered, it could reach any ship just in time for delivering the fatal blow... This tactic generated many special-purpose ships, and the David was one of these, probably one of the most interesting one. With its cigar-shape it looked like a submarine, but it wasn't. Born on the drawing board of an unknown southern engineer, it was built as a private venture by T Stoney of Charleston, with in mind the sinking of the most formidable ship the Union has dispatched, ironclad USS New Ironsides. The David was basically a cigar-shaped wooden, metal covered semi-submerged spar torpedo vessel. For weight distribution, the boiler was in the center, the exhaust beeing a tall and narrow funnel, the only protruding structure of this unusual ship, with a single hatch. The crew was limited to three men and an officer. The ship was small and cramped, in order to navigate in the shallow waters of the Mississippi and the bay of Charleston. Despite the fact its was entirely metal cladded, the david was unarmoured. The water itself formed, once submerged, the best natural protection available. At this time, US naval guns had a limited range and were only capable of direct fire. The David was built in record time, carrying a 70 pound explosive charge attached to a five to six meters pole. It was design to operate on moonless nights, under calm weather, burning an anthracite coal making almost no smoke. Its first mission came in the night of october, 5, 1863, under Lieutenant William T. Glassell command, attempting to sink the New ironsides. Despite beeing discovered by a watch onboard the USN ship, the David sucessfully plunged ahead and stroke its starboard quarter, but the ensuring high water column ran back on the CSN ship, and its boiler took fire. As the David was disabled and seemed doomed, and all the New ironsides (which survived with only four casualties) crew pouring small arms fire on it, all the crew but one managed to get away swimming - Two of them would be captured afterwards. The remaining pilot, and an engineer, which returned on board, somewhat managed to steam the torpedo ship out of range. The New ironsides was the sole true sea going ironclad of the entire Secession war, and the first of the united states. As soon as the Union admiralty had clues about a new confederate ironclad, the Virginia, proposals for a new ironclad, and perhaps more to come, was issued. In fact, many designs were submitted, and three were retained. The first was the most revolutionary and cutting-edge technological marvel: The Monitor. The other was the rail-covered USS Galena, with a turtle hull to deflect gun shots, and eventually, the New Ionsides, first christened USS Constitution. Of course the surname which became popular was inspired by her first namesake : The "old" versus the "new" ironsides, as the first, historical frigate was affectionously called "old ironsides". And the "new" ironsides was truly iron-armoured contrary to the 1797 frigate. This ship was more an american version of the french "Gloire" rather than inspired by the HMS Warrior. It was short, wide, possessed a wooden hull covered with iron plating and coppered below waterline, three masts and a single artillery deck with side Dalghren guns. Armour was complete, extending from the entire lenght of the hull, from one meter below waterline to the upper gallery. The hull was flat-bottomed, with a rectangular ram, there was a single shimney. Merrick & Sons made the design proposals, but construction took place at William Cramp and Sons as sub-contractor. Just after the battle of Hampton roads, the original planned armament of 16 9in Dalghren guns was changed to fourteen 11in Dalghren guns and two 8in Parrot rifles. Later on, two chase 50-pounders, and later 60-pounder guns (5in) were added on the upper deck. The ship was launched in may 1862 and commissioned in august. Shortly after commission she sailed to Hampton roads, joining the blockade under Rear Admiral Goldsborough command. Some steering and gun recoil problems occured after trials, which were never really solved in september where she returned from Philadelphia to Hampton roads, were the Monitor and Galena were already stationary. Her career goes on until the night on 5 october 1863 when the CSS David succesfully "torpedoed" her. She was then put on decommission for extensive repairs and complete rebuilding. When she was re-commission in august 1864, whithout her masts and rigging, spending her late career chasing blockade runners, shelling forts and patrolling, to the end of the war. Decommissioned and moored at League island, philadelphia, she was struck by a fire which destroyed her in december 1866.